Is it unusual to find a Jesus (“Jesus (?) son of Joseph”) and a “Judah son of Jesus” in a Talpiot tomb? What are the chances that there might be another one like this in Talpiot? Not too likely? CJO 113 is inscribed in Greek: IHSOYS IOYD(OY), “JESUS SON OF JUDAH”; ornately chip-carved. 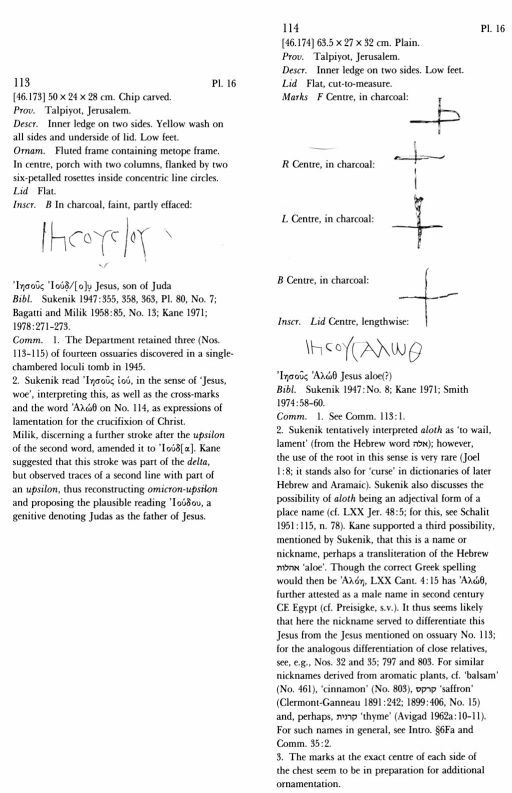 Both are from a single tomb in Talpiot (published in Rahmani’s catalogue), located not far from the “Lost Tomb of Jesus.” What are the odds?! “Clarifying” the Dominus Flevit tomb part 2: Is this the final resting place of Simon Peter?